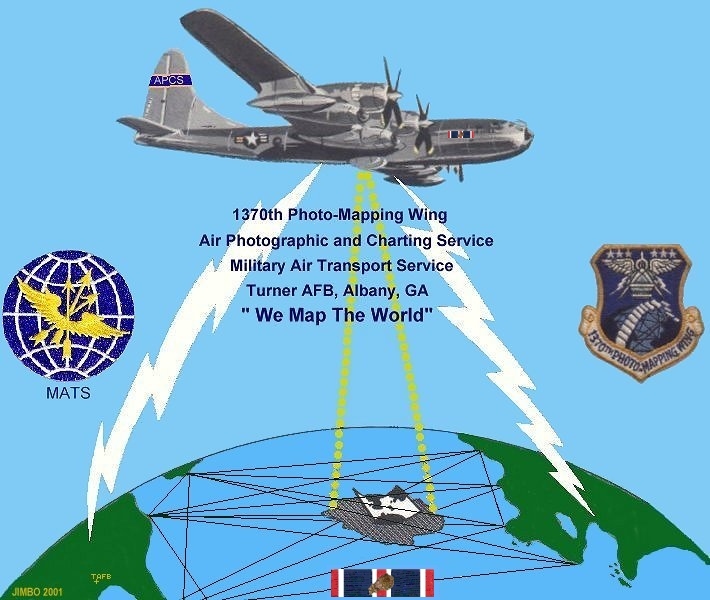 The 1370th Photo-Mapping Wing has sole responsibility for the Air Force's aerial mapping photography and electronic surveying. The three fold mission includes world wide precision photo-mapping, electronic controlled photo-mapping, and aerial electronic geodetic surveys. The Wing is organized into seven squadrons, one operation location, and several aerial survey teams. The more than 1,500 assigned personnel based in Albany spend approximately half of each year deployed to project locations all over the world. The flying operations are accomplished by 39 aircraft including RB-50, RC-130, C-54, C-47, and CH-21 types. In this age of high speed and largely automatic flight and increasing importance of missiles, the size and shape of the earth and the exact location of points on its surface are of great national significance. The 1370th gets the airborne data which is the raw material for the fantastically accurate map these requirements demand. Aerial Survey Teams are the "Work Horses" of the 1370th Photo-Mapping Wing. They are composite units of personnel and equipment that go into the field in areas throughout the world and function as a complete team accomplishing aerial photo-mapping and surveying. Supplies and logistics support are furnished through the 1370th Supply and Materiel. Primary mission flying is accomplished by either the 1371st, with their RB-50's, or the 1375th, with their RC-130's. The 1371st also furnishes flying personnel for the C-54's, C-47, and CH-21's used as cargo carriers. 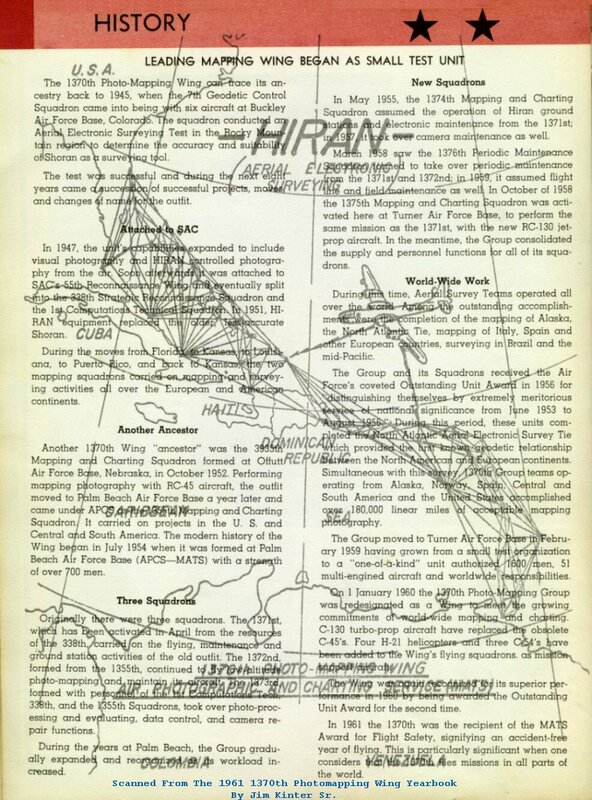 Communication and electronics support and personnel for the HIRAN ground stations are furnished by the 1374th, while the 1373rd furnishes the photographic processing, evaluation, geodetic computations and technical planning for aerial surveying. All this equipment and aircraft used must be maintained and this is done by the personnel of the 1376th CAMRON under the supervision of the chief of maintenance. The 1370th Photo Mapping Wing moved to Forbes AFB, Kansas, in May 1966. Its commander, Col. Ted Tatum, had previously headed the USAF's Air Rescue and Recovery Service, and between that and the adventures of the photomappers, he and his men could tell more tales than Baron Munchausen -- except theirs were true. Equipped with big four-jet Boeing RC-135s, the 1370th had a global mission: Triangulating on ground transmitters manned by small parties of airmen, the planes took high-resolution strip photos from nearly five miles up and used them to produce history's most accurate maps. That put them into the wilds of Ethiopia, where lions ate their pet dog; into Melanesian islands where natives sliced off the tops of monkeys' skulls and ate the living brains; into Morocco's Atlas Mountains to share goat's eyeballs with a bandit chieftain. In October 1968 the wing was redesignated the Aerospace Cartographic and Geodetic Service. It remained at Forbes until 1973, the last major unit to leave.